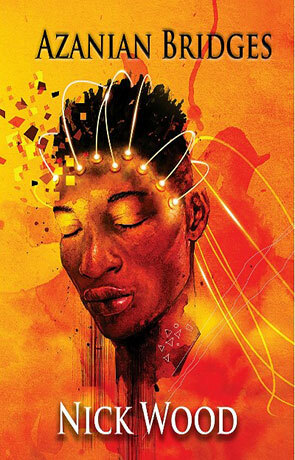 Science fiction set in the near future, Azanian Bridges is a rough diamond, drawing on a variety of influences to deliver a real and wrenching story. Our setting is an alternative South Africa, where Mandela was never released and Apartheid didn’t end. We follow two characters, Martin and Sibusiso as they narrate their perspective of the events in their lives leading up to and after the moment they meet. The read can be a bumpy one at times, with a little repetition and rhythm that isn’t quite polished, but this is quickly forgotten as the powerful narration takes hold. Wood makes use of a variety of devices. The use of two first person narratives, one from each side of the prejudice fence creates interesting contrasts when both experience similar circumstances, but are reacted to in different ways. The 'EE' machine is a similar concept to the Baker-lite box from Simon Ings’ Painkillers, but here, its careful placement and usage serve as something to fight over, particularly as it might provide a way to end the vicious institutional racism of the times. There is something of Orwell’s Nineteen Eighty-Four about the story. Wood regime seems less austere, but rapidly demonstrates itself to be more vicious and cruel. Sibusiso makes friends, but rapidly loses them in the struggle to survive amidst the circumstances that engulf him. Whilst Winston finds hope and a sense of power from his rebellion, only to have this taken away, Sibusiso is less fortunate. The moments of peace and calm in his life are fleeting and even when he is free, the price, cost and obligations of his liberty drive him into more danger and more risk. By contrast, Martin’s plight highlights the passive restrictions of this binary society. Whilst both characters fear the outcomes of their circumstances, the way in which Martin is able to change his situation, where Sibusiso is not demonstrates clearly how the culture of fear and institutionalised prejudice works. Indeed, there is no place for Martin to hide from his own racism, particularly when wired up to a box that allows others to read his mind. White privilege resolves a perilous situation and whilst risk brings little reward, you get a sense that Martin might not have been in as much danger as he believed he was, certainly not by comparison to Sibusiso and its here that Wood shows his skill as a writer and his ability to translate and reform experiences. The comparisons inside and outside of the book highlight the dramatised reality of the context. Sibusiso to Martin, Sibusiso to Orwell’s Winston, etc. Room 619 is a direct parallel to Room 101, but where the latter has lost its ability to terrify us, having been neutered by British TV comedy, Wood quickly builds his equivalent into a chilling myth. We are told there is no hope for anyone sent there, but we still try and hope as characters strive to escape. There is some abstraction towards the end of this, perhaps the way in which a prisoner handles such a situation, but this does soften the punch to the reader, particularly when drawing a direct Orwellian comparison. Azanian Bridges is the kind of science fiction story we need, a reflection and re-imagining of a shameful moment in world history resurrected and thrust into a new context, making those who might never have realised just how horrific the circumstances of 1980s South Africa truly were and could have become if left unchecked. The humanity of the story is stark, particularly in laying out the little choices people might make to unconsciously reinforce such a regime. It is a book to make you think and consider yourself alongside those caught up in these events. Something we all need to do at times. Written on 19th February 2016 by Allen Stroud.